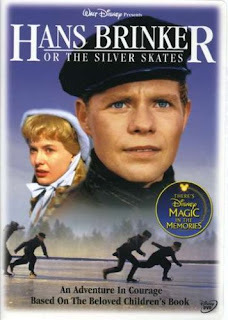 Back in 1962 when it was called Walt Disney's Wonderful World of Color, the film Hans Brinker or the Silver Skates was featured in two parts on the television series. The movie is an adaptation of Mary Mapes Dodge 's novel about a Dutch boy and his family. In the story, the Brinkers live simply and happily until an accident injures the father and Hans finds himself responsible for supporting his family. He struggles with odd jobs, and when he discovers a surgeon who can help his father recover he realizes he must do something to earn the money to fund the treatment. Hans and his younger sister travel to Amsterdam to compete in the annual ice skating race to win the prize money, but are at a disadvantage because they only have wooden skates, not fine silver skates like the privileged city youth have. The movie's exploration of class differences, family relationships, and determination is well-done for a film of its era. The story is set in 1860's Holland and is a colorful way to acquaint your kids with 19th century Dutch life. Filmed in the Netherlands with a native cast, the windmills, traditional Dutch costumes, wooden clogs, and, of course, ice skating hallmark this delightful story of adventure and courage. I've never seen it. This will have to be one of our Friday Family Film Fest picks in the near future. Thanks for the recommendation.